Premature newborns often require special care from nurses in a neonatal intensive care unit (NICU) as their tiny bodies develop. Nurses want babies to sleep on their backs before they go home, but while they are in the NICU, Associate Professor Karen Klingman from Upstate Medical University’s College of Nursing says newborns often need to be repositioned to aid their growth. Upstate Medical University had interest in doing research on how sleep position could affect development of babies in the NICU, but right now the only data is from nursing logs entered manually each day. To develop an improved data collection method, Upstate Medical University professors teamed up with bioengineering seniors in the College of Engineering and Computer Science to design a sensor that monitors infant sleep positions. 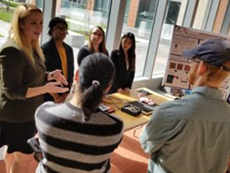 For their senior capstone design project, Anderson and Tierney Clark ’18, Ao Li ’18 and Sarah Venn ’18 designed and constructed a prototype using sensors underneath fabric connected to a custom-coded microcontroller board. Li was born prematurely and she hopes their design will lead to more accurate data on some of the most fragile patients in a hospital. “The data collected by the computer is continuous and complete, so that will make the nurses’ work much more efficient,” says Li. The device can measure pressure from an infant’s shoulders, behind, head, stomach and knees—and with input from experienced nurses and engineers, the interdisciplinary project showed strong results during testing. “We couldn’t have done it without them and I don’t know they could have done it without us because they wouldn’t have the expertise to know what to look for,” says Klingman. Does Your Smartphone Know the Real You?